New York-based Matteah Baim (Metallic Falcons) presents her third solo release in "Falling Theater". Just released last week, and serving as the follow-up to 2009's "Laughing Boy", the eight-track "Falling Theater" is (theme-wise) an album said to reflect the state of America's pre-war movie theaters: both luxurious and decayed. That little nugget of information is very important in the grand scheme of things (or at least later on when it comes time to picture what this fashionably dated album is trying to say) as is the understanding that Baim is another talented New Yorker with both a visual arts background and a musical one! Recorded and mixed by Eric Gorman at his studio in Brooklyn (with arrangements having come by way of Antony and the Johnsons member Maxim Moston) "Falling Theater" features a plethora of special guests such as Antony Hegarty (also of Antony and the Johnsons), James Richardson (MGMT) and various members/musicians of dream pop band Au Revoir Simone, The New York Philharmonic and The Boys and Girls Choir of Harlem! As a graduate of San Fransisco Art Institute (where Baim received her Bachelor of Fine Arts in painting and drawing!) 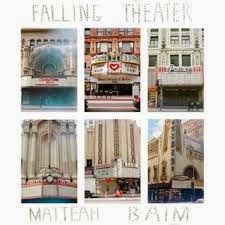 Matteah puts all of her various talents into the musical/orchestrated soundtrack that is "Falling Theater" and when one listens to this very brief album it really does feel as if you are in another era! When looking to place "Falling Theater" into your neatly arranged CD collection it would make the most sense to create a new category as this atmospheric Dream Drive Records' release is one of a kind. Picture a poetic album that is seamless, softly psychedelic and casually dreamy. One that captures the sounds of old-fashioned musical theater, non-religious hymn arrangements, art-house folk and melodic dream pop and is then aided by Matteah Baim's healing, whisper-like voice. Such a lush little album like this one (at best it's like 25 minutes long!) deserves it's own slot in a music collection as (structure-wise/sample-wise) "Falling Theater" gathers together the tiny particles of life that continuously surround us and then this delightful singer/songwriter grants these elemental structures a new audience! Matteah Baim's latest solo release was an absolute pleasure and for those who might still be on the outside looking in "Falling Theater" also goes about proving once more that the combination of art and music does not have to be too pretentious or cerebral for it's own good. Instead it can be beautiful and graceful for those willing to open up their hearts to the possibility of previously foreign ideas!